The Yala National Park in the south of Sri Lanka has always been one of the most popular national parks in the country, drawing a large number of visitors, both Sri Lankans and foreigners. However, of late, there has been a dramatic increase in the number of visitors, which is causing a great threat to the environment and the animals. The Yala National Park has various eco systems, consisting of open grassland, tanks, water holes, coastal lagoons, estuaries, mangroves, moist monsoon forests, dry forests and fresh and brackish wetlands and beaches. Yala is an important birding area where over 200 bird species are found, of which six are Sri Lanka’s endemic species. There are flocks of migrant birds, particularly, water birds, who visit the wetlands of Yala. There are 44 species of mammals resident in Yala with Sri Lanka’s ‘BIG 4’ –The leopard, buffalo, bear and the elephant, being quite prevalent. Yala is said to have one of the highest densities of leopards and Mugger crocodiles in the world. 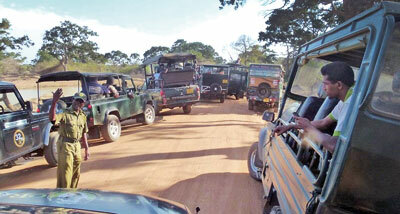 Fuelled by the post war tourism boom, visitor numbers to Yala have been growing rapidly. In 2011 Yala had close upon 99,000 foreign visitors and 217,000 local visitors. (ref. Sri Lanka Tourism Development Authority –SLTDA) . The 2012 figures are not yet available, but the total visitation is said to have exceeded 700,000 in 2012. In fact it was reported recently that last month -on February 13, there was an all-time record at Yala with 1000 foreign and 500 local visitors, bringing in revenue of Rs 2.6 m for the day. On an overall basis, local visitors outnumber foreigners almost three fold. Also it is significant that the next two most popular parks record only a mere 197,000 visitors (Horton Plains) and 77,000 visitors (Uda Walawa), compared to the 315,000 visitors for Yala for 2011. However, the picture is totally reversed when the earnings from park entrance tickets are analysed. For 2011, from a total of 99,000 foreigners visiting Yala, revenue of Rs.155m was generated, while 217,000 Sri Lankan visitors generated only Rs.12.5 M revenue. This vast differential is due to the large price difference in the ticket, between foreigners and Sri Lankans. Hence Yala( and other National Parks) , are important for tourism, and bring in good revenue to the state. Yala gained considerable enhanced exposure and popularity in the last five years, when research emerged that the park was harbouring one of the largest leopard population densities in the world. Fuelled by strong publicity and exposure by popular wildlife programmes on Animal Planet, National Geographic and BBC, very soon Yala became a ‘hotspot’ for leopard sighting. Over the years, the leopard population in Yala has grown, and today it numbers close to about 50 leopards inhabiting a very small area of the park. This fairly healthy population, a large number of who have grown up accustomed to humans and jeeps, now enables visitors to have a very good chance of a leopard sighting during a game drive in the park. This single aspect has been the main cause of the drastic increase in visitation leading to the current situation. Fundamentally, all the problems really stem from over-visitation and demand, where the supply (safari vehicles and guides / trackers) vie for business from visitors for safari rides. It is estimated that there are over 250 jeep drivers operating in the Yala area, most of who have had no experience nor interest in wildlife, but have gone into the business to make a ‘quick buck’. Profit margins are high with a single safari driver earning Rs.4,000 -Rs.5,000 per safari of approximately three hours, together with ‘handsome tips’ for a unique sighting, particularly of leopard. This overwhelming demand, especially for leopard, pushes the safari drivers to break the park rules in their effort to please the customers. The Department of Wildlife Conservation (DWC) under whose jurisdiction the park, flora and fauna comes, is often powerless to enforce the park visitation rules and regulations, since there is great interference and patronage for these drivers from powerful external sources. In addition, due to typical government bureaucracy and other complicated procedures, there is an acute shortage of trackers (game wardens) in the park, which results in more than 50% – 60% of the vehicles going into the park without a tracker in attendance (usually, every vehicle is accompanied by a tracker who is responsible for the vehicle, its occupants and proper adherence to rules). Hence, all these problems have compounded the issue to a crisis point today. With the rapid growth of tourism in the past three years, and wildlife tourism also gaining popularity in Sri Lanka, the number of tourists to the area has also increased together with new hotel developments. SLTDA statistics reveal that of the 855,975 tourist arrivals in 2011, 198,536 visited the national parks( 23%.). Hence it is clear that while Sri Lanka is not, and never will be, another Kenya, wild life tourism is certainly playing an increasingly important role in Sri Lanka’s tourism offering. Currently, there are a total of 340 rooms in star class hotels and over 155 rooms in guest houses, in and around the vicinity of Yala, giving rise to a total of 505 rooms. There is also on record from SLTDA, that a further nine hotel establishments have been given approval for construction, which will add another 195 rooms to this current stock of 500. As it is, with these 500 rooms, at any given time, there could be 75-100 jeeps inside the park, and it will not take any major arithmetic to figure out what a further 195 room occupancy will contribute to the issue.�So there is no running away from the fact that the problems are only going to increase as time goes by, and tourism will be certainly ‘ fuel the fire’. List out a comprehensive ‘wish list’, somewhat like what is done at a brainstorming session. It will be then clear that almost all of the solutions fall within the purview of the DWC. At the same time we all are well aware of the multiple and complex issues that are prevalent with the DWC, limiting their ability to function effectively and efficiently. However there will be several of these activities/ interventions that can be strongly influenced by interested stakeholders, and even be implemented in an indirect manner.. 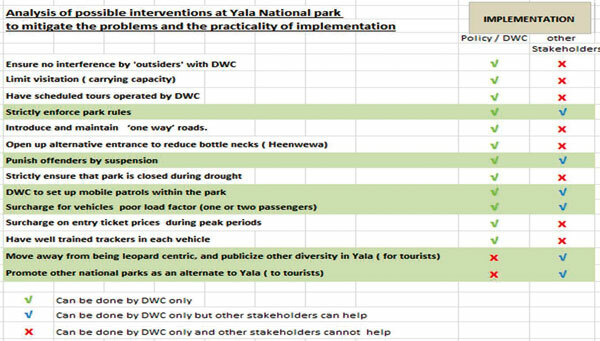 It is evident from this analytical matrix, that some activities , such as limiting the number of visitors into the park at any given time, to prevent overcrowding, will require high level decision making at Government level, which, given the current context, would be a ‘pipe dream’. And no amount of other interested stakeholder activity or pressure, would perhaps help the implementation of such a new regulation. Strictly enforce park rules- create awareness among all visitors to bring pressure on drivers to behave properly. Surcharge for vehicles with poor load factor (carrying one or two passengers)- Hotels/ DMCs /tour operators can offer single or twin guests the option to double up with others to increase the load factor per vehicle. It is quite clear therefore, from the foregoing, that Yala is important not only to environmentalists, but also for tourism and for all Sri Lankans alike, since it is a national asset. Also, it is clear that the problems at Yala will only keep increasing with time. �It is also quite clear that the main agency that should be at the forefront of trying to solve these problems, the DWC, is unable to tackle the issue, due a complexity of reasons. It is important therefore, that all stakeholders put their ‘shoulders to the wheel’ to help in any way they can, to mitigate the on-going problems, without�being armchair critics, and pointing the finger at others. We need to act in whatever small way we can, now.